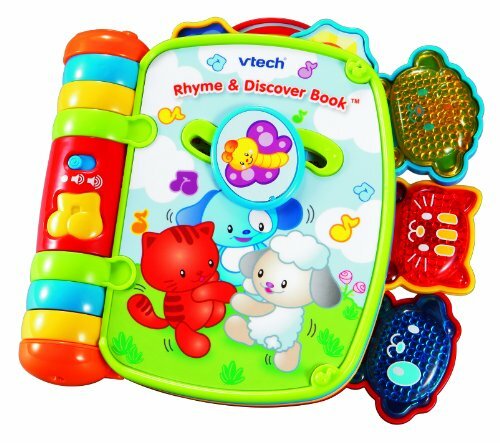 Open a page to learning with the Rhyme & Discover Book by Vtech! The Rhyme & Discover Book combines rhythm and rhyme with seven nursery favorites. Baby will delight in the fun melodies, magical moving play, three light up characters and open ended questions that encourage thinking and most importantly, learning.VTech, the creator of the Electronic Learning Products (ELP) category, is a world leader of age-appropriate learning toys. Since 1976, VTech has been developing high-quality, innovative, educational products for children from birth to preteen that deliver "smart play" through the combination of entertaining electronic formats and engaging, age-suitable content that help children learn while having fun. VTech believes kids have the power. Vtech's innovative toys for baby, infant, toddler, preschool and grade school ages enrich children's development and help them meet their milestones including products such as Bugsby Reading System and Software. VTech is a leader in kid's laptops, learning toys and games. Vtech's V.Smile TV Learning System is a constant award-winner ensuring your kid will learn through fun and smart play.